Aussie’s new 24 volt wet/dry vac keeps miners safe! 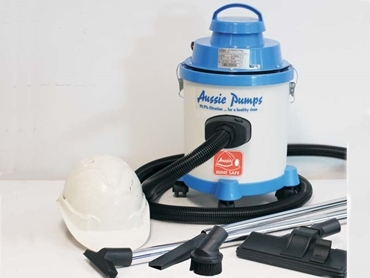 Australian Pump Industries has introduced a new range of compact wet/dry vacuum cleaners designed to deliver a powerful performance in the clean-up of mine trucks. The new Aussie 24-volt vacs pack a lot of punch with a 1200W motor and an airflow of 20 litres per second. The new vac was developed for permanent installation in the cab of dump trucks working in mine sites. “The idea is to clean the cab between shifts so the operator is protected from inhalation of coal dust,” says Aussie Pumps’ Neil Bennett. Key features of the new Aussie vacs include powerful, but reasonably quiet operation with noise level of only 71.5 dbA; high tech Aussie Microweb 99.9% filtration system; and a handy set of professional tools, enabling the operator to clean up the cab at the end of the shift. The Aussie Microweb filtration system features a filter media constructed from a homopolymer acrylic fibre. A micro-porous membrane is applied to the collection service, making it ideal for picking up coal dust and preventing it from re-entering the atmosphere. The membrane provides a low pressure drop causing the dust to ‘cake’, thereby allowing much better dust release than conventional filters, as a single shake of the filter cleans it perfectly. The Microweb is considered essential for any kind of fine dust produced from coal, limestone, cement, gyprock or even pigments and fertilisers. The tool kit provided with the Aussie vac includes a heavy duty 3-metre crush-proof hose, crevice tool, carpet and floor tool, squeegee with swivel, 3-piece chrome assembly with handle and a round brush.